This weeks guest Blog is compliments of George Blomgren, author of the not so cleverly named For Job Seekers"blog. George likes it when job candidates take control of interviews and start asking questions. Here's why. create a huge competitive advantage for themselves. In this posting, I want to focus on one particular aspect of this powerful. 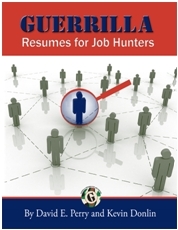 As a job candidate investigating a job opportunity, you are a salesperson exploring a potential customer's needs. In fact, you are in an extraordinary sales situation: generally, your prospect has signaled that they are in "buying mode," and (through the job posting, for example) they have provided a lot of clues about what they are looking for. Sales people rarely find themselves in such a sweet situation. However, many candidates fail to leverage this sweet situation. Some candidates present themselves with what I can best describe as a "here I am, here are my credentials, hire me" kind of attitude. From a sales standpoint, this is akin to setting the your product in front of a prospect without any effective attempt to sell it. Not a terrible approach, especially when your product's value and benefits are exceptional and self evident (again, said product being you), but you're leaving a lot to chance. Some candidates, recognizing the need for more, promptly jump into a sales presentation. This can be worse than sitting back and letting the customer (the employer) draw their own conclusions. After all, if interviewers draw their own conclusions, at least they are drawing conclusions that are 1) relevant to their situation, and 2) are credible (people generally believe what they tell themselves). Instead, take a cue from really good sales people. Rather than jumping directly into sales presentations, they ask questions. Questions that ferret out hidden needs and establish credibility. Here's an important insight: your initial understanding of the job, probably drawn from a job description, may very well be out of date or incomplete. Your efforts to determine what the job really entails will set you apart as a thoughtful, intelligent job seeker. Moreover, merely asking good questions will help you start to position yourself. You: A few minutes ago, you mentioned that the individual in this position previously wasn't especially effective? You: May I ask why? Interviewer: She just couldn't really seem to get the job done. You: Sounds like the problem may have involved her project management skills? Interviewer: Yes, project management skills -- I guess that's pretty much what we need here. Woot! Handle this well, and you may even see the light bulb actually appear over the interviewer's head. Be careful, though -- your question should gently lead interviewers, not push, pull or otherwise manhandle them. Anyway, quick summary. One, recognize that a job interview is a sales opportunity. Two, use questions to get at the real underlying needs your "customer" faces. And three, for extra credit (and lots of it) use questions that lead the interviewer to draw their own conclusions about why you are the right candidate for the job.